The Chinese Shar-Pei is an ancient and unique breed. It is thought to have originated in the area around the small village of Tai Li in Kwantung province and thus has existed for centuries in the southern provinces of China apparently since the Han dynasty (c.200 BC). Statues bearing a strong resemblance to the Shar-Pei have been discovered and dated to this period. More recently, a Chinese manuscript of the 13th century has been translated, it refers to a wrinkled dog with characteristics much like those of the Shar-Pei. The name "Shar-Pei" itself literally means "sand-skin" but translates more loosely as "rough, sandy coat" or "sand-paper-like coat" and refers to two distinctive qualities of the Shar-Pei coat -- roughness and shortness -- which make the breed unique in the dog world. The Shar-Pei shares another distinctive characteristic with only one other breed, the Chow-Chow, in having a blue-black tongue, which may indicate an ancestor common to both breeds. However,such a relationship is difficult to prove. The history of the Chinese Shar-Pei in modern times is incomplete. However, it is known that, following the establishment of the People's Republic of China as a communist nation, the dog population in China was essentially eliminated. No dogs were seen in the cities, and few dogs remained in the countryside. During this period a few Chinese Shar-Pei were bred in Hong Kong, BBC, and in the Republic of China (Taiwan). The breed was recognized and registered by the Hong Kong Kennel Club until about 1968. Subsequently the Hong Kong and Kowloon Kennel Association established a dog registry and registered the Shar-Pei. In the United States, the documented history of the breed goes back to 1966 when a few dogs were imported from stock registered with the Hong Kong Kennel Club. The American Dog Breeders Association registered a Chinese Shar-Pei for J.C. Smith on October 8, 1970. 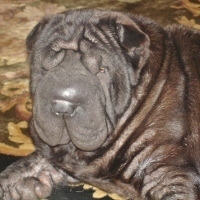 Strong interest in the breed increased in 1973 when Matgo Law of Down Homes Kennel, Hong Kong, appealed to dog fanciers in the US to "Save the Chinese Shar-Pei". The response was enthusiastic, and because of their rarity, a limited number of Shar-Pei arrived in the US in the fall of 1973. The recipients of those dogs formed a national dog club and registry. The Chinese Shar-Pei Club of America Inc., held its first meeting in 1974. The first Annual National Specialty show was held in 1978. "SIDNEY AND REGIS WILL BE TURNING 10 YEARS THIS DECEMBER AND BENTLEY WILL BE 7 YEARS OLD THIS OCTOBER."